In October 2015, I was in El Salvador to help DAI launch the new U.S. Agency for International Development (USAID) Employment Training Project, which works to link at-risk Salvadoran youth to educational and employment opportunities, foster social inclusion, and reduce the space for gangs to influence and recruit young people. While I was there, I made a point to get a sense of the role mobile phones play in young peoples’ lives: do most youth have mobile phones? If so, are they smartphones or basic phones? Which apps do they use? This is the first of two blog posts I’m writing about my time in El Salvador. Find the second post here: Innovation and Entrepreneurship in El Salvador. This post is also part of a larger set of Digital Insights that DAI’s ICT team collects from various developing countries. You can find them here. Salvadorans have been leading adopters of mobile technologies. According to BuddeComm, the country’s mobile penetration rate in 2015 reached 146 percent, which means that there are 1.46 mobile connections for each person in El Salvador; a current population of 6.108 million means there are roughly 8.9 million mobiles connections in the country. The 1.46 figure suggests a rapid growth rate—18 percent—since 2013, when GSMA reported the same figure at 1.24 (or 124 percent) in their Latin American Mobile Economy report (see chart below). 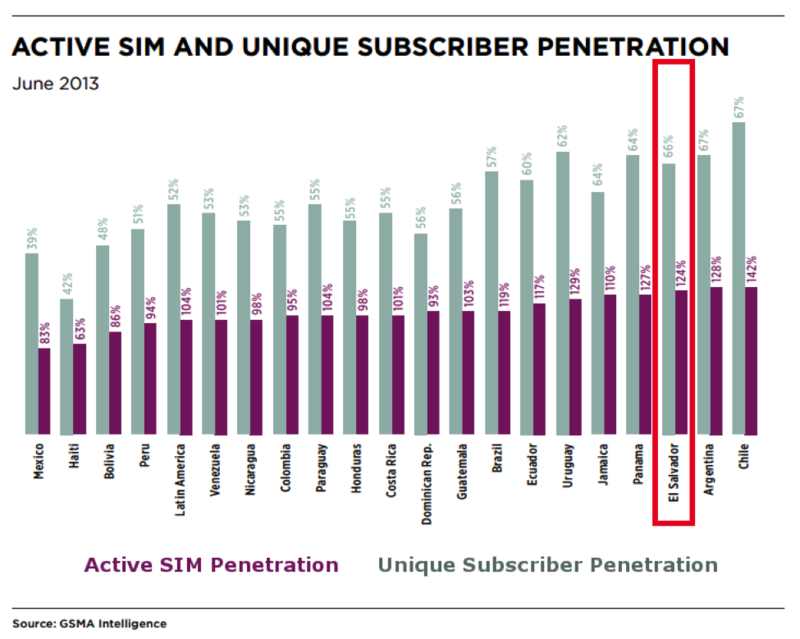 The chart shows active SIM penetration at 124 percent in El Salvador, while the overall proportion of the population that had at least one SIM (unique subscriber penetration) was 66 percent. The chart also gives a sense of where El Salvador stood in terms of mobile adoption relative to other Latin American countries back in 2013, but given the rapid evolution of the mobile market, I would anticipate that data from two years ago would have little bearing on today’s reality. All FG participants had mobile phones, but only one-third reported using SMS to chat, while 78 percent reported using WhatsApp and Facebook. WhatsApp is becoming the “appa franca” in Central America, where companies promote their services via WhatsApp and mobile network operators promote their services based on access to WhatsApp. 44 percent of participants had smartphones, but 78 percent reported using both Facebook and WhatsApp on their phones. This may be due to problems with the language of the survey, the presence of other types of phones (e.g. feature phones) that I didn’t account for, or the possibility that they’re using Facebook and WhatsApp on others’ phones. Similarly, only one-third of participants had mobile data plans but 78 percent reported using Facebook and WhatsApp. This suggests that young people are using wifi connections instead of data plans.